Forget circumspection. When opining about Alex Oxlade-Champberlain, the player Arsenal sold to Liverpool for the best part of £40m, Arsene Wenger was scathing. The Sun and Mirror heard Wenger accuse the former Arsenal player of laziness and made it their lead sport story. 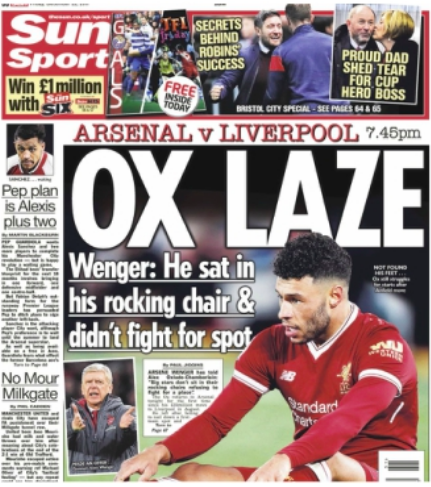 The Sun thunders: “OX LAZE – Arsene Wenger accuses Liverpool star Alex Oxlade-Chamberlain of sitting in a rocking chair and refusing to fight for Arsenal spot.” Wenger gave Oxlade-Chamberlaie a “verbal battering”. 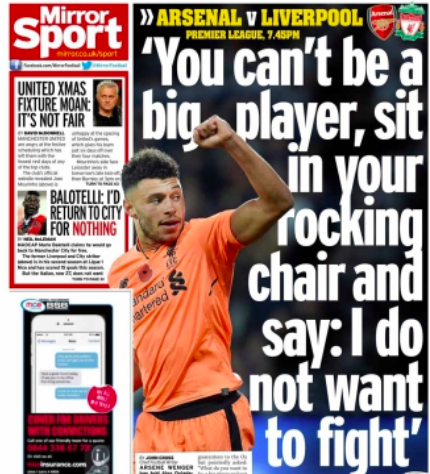 The Mirror says Wenger aimed a “dig” at Oxlade-Chamberlain. “I offered him a contract to stay but in the end he decided to go and we just had to try and get the best possible price.Sometimes it happens when one player who we don’t want to go, goes. If that’s a verbal battering, the mind boggles as to what praise looks like?